Today I finished two books. One was a fluffy, entertaining novel called "Little White Lies". The other was Girl Meets God. It's a memoir by a young, very well educated woman who chooses to convert from Orthodox Judaism to Christianity. 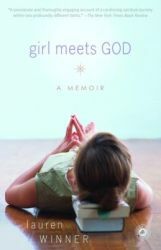 Her story winds its way through her past, her present and her future, describing and analyzing her relationship with God, its evolution and depth. But along the way she meets and is affected by strangers, family and friends. I love the way Lauren F. Winner writes. She might as well be sitting across from me on my couch, legs tucked underneath her, holding a half-finished cup of some trendy iced coffee drink and talking animatedly about her days and years. Far too smart for me; I'd never have a prayer of keeping up. But she is as intriguing as she is intelligent. Over the course of this read I've enjoyed many specific parts, memorized different sentences, laughed out loud at her sheer wit. And, of course, I've marveled at how much I seem to understand about her heart and her faith, her dealings with people she loves. "There are a few people out there with whom you fit just so, and, amazingly, you keep fitting just so even after you have growth spurts or lose weight or stop wearing heels. You keep fitting even after you have children or change religions or stop dyeing your hair or quit your job at Goldman Sachs and take up farming. Somehow God is gracious enough to give us a few of those people, people you can stretch into, people who don't go away, and whom you wouldn't want to go away, even if they offered to." -- Lauren F. Winner, Girl Meets God . "Aud, it's Cin, and I called because I just read a part in [Girl Meets God] that totally made my think of you! And it is going to make you think of me. So, when you read it, call me." Scary, isn't it? That she didn't tell me a thing about the passage she was talking about, the one that had inspired her to call me, the one that made her think of two people and two people only. Yet when I read on in the book and happened upon the paragraph above, everything clicked into place in my brain. I too could only think of two people. My best friends. My Ya-Yas. "There are a few people out there with whom you fit just so, and, amazingly, you keep fitting just so even after you have growth spurts or gain weight or start wearing heels. You keep fitting even after you get married or move to San Diego or dye your hair blonde or quit your job at the coffee shop/Banana Republic/Macy's and take up a different coffee shop job/insurance brokering/work at a print shop . Somehow God is gracious enough to give us a few of those people, people you can stretch into, people who don't go away, and whom you wouldn't want to go away, even if they offered to." I was in Yosemite with Jon when I did read that part and knew without a doubt that I was feeling what Cindy had felt. Of course, there's no cell phone reception in Yosemite. But once at home again we talked and laughed as hard as only sister-close friends can laugh at something so amazing. Someday I'll write a book, too. Probably not a memoir. I doubt I'll go on to achieve an advanced degree in anything and, without insulting the career I'm embarking on at the moment, there is so little about insurance that begs to be written about in an entertaining fashion. But I'll write one nonetheless. Let's just hope I sound as smart and insightful and funny as Lauren Winner. Whether I do or not, though, there is another great thing about having friends like the Ya-Yas: I'm guaranteed to sell at least two books.